It takes more than just one abnormal blood test to diagnose diabetes. For centuries, diabetes testing mostly consisted of a physician dipping his pinkie into a urine sample and tasting it to pick up on abnormally high sugar. Thankfully, testing for type 2 diabetes is lot easier now—at least for doctors. 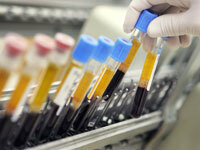 Urine tests can still pick up diabetes. However, sugar levels need to be quite high (and diabetes more advanced) to be detected on a urine test, so this is not the test of choice for type 2 diabetes. Almost all diabetes tests are now conducted on blood samples, which are collected in a visit to your physician or obstetrician (if you're pregnant). If you have an abnormal result—meaning blood sugar is too high—on any of these tests, you'll need to have more testing. Many things can affect blood sugar (such as certain medications, illness, or stress). A diabetes diagnosis requires more than just one abnormal blood sugar result.